Don’t Be Late for SchoolDocs! One of the coolest happenings at SilverDocs is SchoolDocs, which caters to media educators. I’ll be highlighting some of the SchoolDocs sessions over the next couple of weeks, both before and during the conference. I want to start by focusing on a couple of groups that are evangelists for filmmaking in the classroom. The MyHero Project seeks to use media and technology to tell the stories of heroes great and small. Using the stories of heroes as a vehicle, the project offers resources to young filmmakers around the world, empowering young people everywhere, and also hosts the MyHero Film Festival. MHz Networks provides filmmaking training for both teachers and students in the Northern Virginia area, runs The Shortie Awards: International Film & News Festival, and promotes global learning through its international programming (full disclosure: I am an employee of MHz Networks). – MyHero’s workshop is called “It’s a Team Effort: Filmmaking in the 21st Century Classroom” and participants will explore the elements of award-winning hero films, get hands-on experience with online production resources and discover exhibition opportunities for their students’ works. – MHz Networks’ event, “Reel Learning in the Classroom: Turning Curriculum into Dynamic Student Movies” is a hands-on workshop that takes participants step-by-step through the process of developing a specific item of curriculum into a story ready to developed into a classroom film. Brainstorming strategies and organizational tools will be shared, as well as fundamental classroom filmmaking tips to aid educators in efficiently producing their own student-driven media. 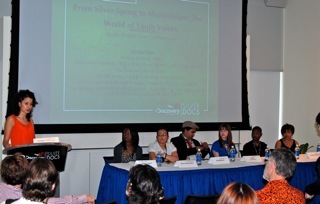 – The Youth Voices panel where eight youth filmmakers will speak about their work and screen their films. The presenters are MyHero participant Slater Jewell-Kemker (AN INCONVENIENT YOUTH); The Shortie Awards Documentary winner Bryan DeLeon (A CRECER COMO UNA PERSONA); Namgyal Trichen (MY COUNTRY IS TIBET); Cindy Roman and Benjamin Andino (JOVANES PA’LANTE ); AFI TeenDocs winners Regina Nicholson (GLIMPSE OF HORIZON), Ja’Mesha Hagins (REEL LIVES: ANTHONY), and Joshua Zucker (WLADEK). Why do you need to check out this event? As one of the organizers of The Shortie Awards, I have seen how filmmaking excites students. Teachers have told me that filmmaking is a great way to get kids to learn, without their knowing it! These sessions will be a great opportunity for media educators (or any teacher interested in incorporating filmmaking in the classroom) to learn about best practices and, more importantly, to understand how accessible this teaching tool is! Educator Passes are still available at Silverdocs.com! This entry was posted in Uncategorized and tagged Benjamin Andino, Bryan DeLeon, Cindy Roman, documentary films, Ja'Mesha Hagins, Joshua Zucker, MHz Networks, MyHero Project, Namgyal Trichen, Regina Nicholson, SchoolDocs, SILVERDOCS, Slater Jewell-Kemker, Youth Voices. Bookmark the permalink.